Being aware of these total costs gives me additional motivation to make sure every minute is well spent and the benefits far outweigh the costs. Here are some things I’ve learned over time that will lead to a great leadership development experience. I’ve already written about this topic – see “10 Ways to Involve Leaders in Leadership Development Programs”. Involve them right from start to finish, and everywhere in between. You’ll get a better workshop and the learning will be reinforced – that’s a given. However, here’s the real secret sauce of involving executive sponsors and the participant’s managers: they end up learning and role modeling as well! I’m not sure if there’s an official name for this phenomenon, but I’ve been calling it “the ripple effect”. As you design – always bake in ripple throughout the process. More ripple = more ROI. I’ve never been a fan of unscreened, open enrollment programs. I’ve found that careful participant selection can make or break a program. Consideration should be given to skill level, common interests, challenges, and needs, motivation, and diversity. Take advantage of activities, breaks, meals, and evenings to promote networking. I understand the value of self-discovery and learning from our peers – that’s all well and good. However, the best leadership development programs always include some amount of fascinating and incredibly relevant content. That is, helpful tips, new ideas, proven best practices… the kind of content that causes participants to light up, pick up their pens and start writing. The source of this content can be internal or external experts –there’s a time and place for both. Or, extraordinary content could be researched or purchased, and delivered by a skilled trainer. Extraordinary content by itself will not always produce learning, and certainly not development. Great leadership development programs always have at least 50% of the time devoted to doing. The “doing” can include action learning, case studies, discussions, role plays, white paper development and presentation, and simulations. Every leader is different, and no workshop could possibly be designed to address each leader’s specific development needs. In order to ensure these unique needs are uncovered and addressed, build in assessment, feedback, coaching (peer or professional), time for reflection and individual development planning. It’s unfortunate, but I’ve seen great programs unravel due to inadequate meeting rooms, horrible food, ice cold or sauna-like room temperatures, technology failures, guest speakers not showing up, and all sorts of other little things that were just overlooked. My approach is to plan it like a wedding – think through every little thing that could go wrong, and have back-up plans for every kind of emergency. Your timing couldn't have been better. Our company hosts a dealership training every month. After sitting through the last one as part of my training, I wish to implement some key changes that I believe will be valuable to our dealerships and ultimately to our sales growth. Thank you for some great things to remember. I really like the pre- & post-event work. Following up on promises made to the group, I think, is essential to building credibility and integrity. Organizing a networking session or dinner afterwards would be a wonderful addition to the program. Your emphasis on participant selection is important - the right chemistry can create sessions that push people to new highs in participation and creativity. And yes, the devil is in the details regarding logistics. Good post! I enjoyed your post and agree with your points. As one who has designed and delivered leadership development workshops as well, I might add an element to these great tips. We have all been to training and development workshops that have had great content, great speakers or facilitators, great material, great food and venue. Yet, when we return to the office, we get back into the norm of the routine, we put the material we learned that came in a great binder, up on our bookshelf, and there it remains. I think the point to add is that great leadership development workshops have a component that enables them to last back at the workplace; a component (beyond the individual development plan, which is important) that motivates and encourages the participant leader to do at least one thing differently when they return. 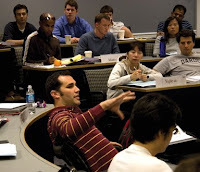 To me, this is where the return on investment comes in - when they can implement a new learning and have it pay off for them; they become a better leader not just because the attended a great workshop, but because they implemented something great, they implemented a new habit that is life changing for them and those they lead. Good, I'm glad you'll be able to use some of the tips right away. Thanks. Who's in the room can be as important as who's in front of the room. Good point! I should have referenced an earlier post I did on measuring the impact of a leadership development program. I am now entering my 16th delivering leadership development programs for major corporations around the world -- and you nailed this list extremely well - and the comments from other readers take it to another level. Superb advice all around -- I will be posting a link to this on my website. Thanks so much! You're welcome! And thanks for the mention on your site. Dan, I don't know if you placed your points in any special order but I'm so glad you put executive and management involvement at the top of your list. I have been part of some really great programmes over the years both on the receiving and the delivering end. These have covered at least six of the points you raise and have left people feeling energized and looking forward to Monday morning. But, because the executive weren't involved (except to fund the program), all the new things learned and the new ideas that came from them drifted off into a disappointing netherworld with only a few shiny (soon to be dusty) binders as proof that they ever took place. When its time to apply new learning in the "real" world, Executives who do not participate will not have knowledge enough about what is being learned to make space for new and different activity. No, I didn't think about the order, but I agree with you. Thanks, glad you enjoyed it! I believe the 3rd step "pre work/ post work" is often over looked and follow-up tends to be lacking. Companies spend money to send out off to these workshops to soak in the information but fail in continuing to apply and retrain. Getting your employees more involved before the workshop would get them in the mindset and the continued training afterwards would keep them learning and growing. right, well strutured pre and post work can transform a learning event into a process. It's also an opportunity to get their managers involved - they often learn a lot as a result of this involvement.